We lucked out big time getting tickets to see Cursed Child. In 2016, tickets were released for online sales for the 2017 time frame. I “waited in line” online for 14+ hours only to have the tickets be sold out. It was upsetting knowing we would be so close to the theater and not be able to see it. Months passed and I had given up the thought that we would be able to see the show. One day, about a month before we would be leaving for Europe, I happened to peek at the website for the ticketing office. I’m not sure entirely why but something made me wonder if they had randomly had any tickets available. They actually did! We wound up with the last 3 tickets available for a Saturday showing of both parts. We sat in the dress circle (which is basically the lower balcony) which gave a great view of the stage. It was absolutely one of the best plays I have ever seen. It was magical – which is exactly how it should be. Me in front of the Studio Tour. Let’s just say, their website recommends about 3 hours to make your way through the tour and we spent almost 9 hours there. We LOVED it. If you are a fan of the Harry Potter films, this is an absolute must-see. The studios are in Leavesden, about an hour outside of London, but it is very easy to get there. We took a train on National Rail (using our Visitor Oyster cards) and a quick £2 bus ride to the Studios. Make sure to book your tickets well in advance so that you can get the entry date and time of your preference. You can’t buy tickets at the door! In addition to seeing many of the sets, costumes, props, etc from the films, you can also take part in some awesome photo ops and try some delicious Butterbeer. Yum! This was one of the tours we took that had an entrance fee and required prebooking. Our tour guide, “Greta Granger,” was absolutely adorable. Bubbly, wonderfully sarcastic, helpful, and very knowledgeable. Ten out of ten, would definitely recommend a tour with her! On this tour, we got to see both filming locations and “inspiration sites” – places where JKR and/or film creators found inspiration for the sets, etc. Much like The Potter Trail tour in Edinburgh, we were able to cover a lot of ground and see things that we likely would not have seen on our own. If there is ever an attraction that recommends “getting there early,” this is definitely one of them. While the line moves relatively quickly, it fills up fast! Though we had been in and out of King’s Cross several times by the time we went to Platform 9 and ¾, it still took us a little bit to actually find the area. The platform photo op and store are actually located between platforms 4 and 5. Once you make it through the line, you’re given the option of your Hogwarts house scarf and a wand to select if you’d like to hold one for your photo. An attendant stands out of the photo area and holds one end of the scarf. 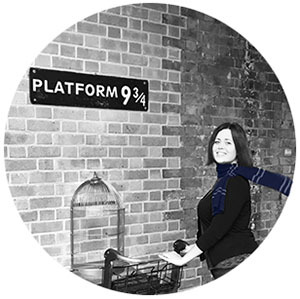 When your picture is taken, they let the scarf go and it looks like your scarf is flying/floating behind you as you “enter” the platform. The nice thing about this photo op is that you’re allowed to take photos on your cellphone as well, so you aren’t forced to buy the professional image. Miraphora Mina and Eduardo Lima are the design team who created the graphic art for the Harry Potter and Fantastic Beasts films. Their work is classic and easily recognized by fans of the HP universe. They have a small gallery and shop in Soho, close to the location of the Harry Potter and the Cursed Child theatre. Floors 1, 2, and 3 showcase the artwork from the Harry Potter films and additional space on the 3rd floor has images from the Fantastic Beasts movie. While we were there, we also got to take part in a short “workshop” in which we wrote and made our own Ministry of Magic memos. Super cute! You can purchase an array of artwork, prop replicas, and much more from the shop on the ground floor. Even better, the House of MinaLima is absolutely free to visit and requires no prebooking to enter. They’re open daily from 12-7 but check before you go to make sure that’s still the case! The zoo was something that was on our original schedule, then removed, then added back in at the last minute. I am soooo glad we decided to do it! The only Harry Potter tie to the zoo is that it was used as a filming location for Harry Potter and the Philosopher’s/Sorcerer’s Stone in the late 90s. The Reptile House is one of the first buildings you’ll see after entering the zoo. There is a display plaque at the front of the exhibit that talks about the filming but that’s mostly it. The real treasure is the zoo itself. The London Zoo is the first zoo in the world, so they’ve figured out quite a few things about how to properly care for animals by now! Two of my absolute favorite things about it: 1) The big cats have TONS of space. In most American zoos, big cats have too little space as evidenced by the psychological effects they experience and their constant pacing. 2) The lemur enclosure! While the lemurs do have traditional caged in areas that I would imagine are used on days when weather isn’t great, the winter months, etc. we were able to visit them in their more open space. They were basically running around free in a controlled environment. So much fun! We couldn’t touch them, but we were close enough that it would have been possible. We did not make separate journeys to visit the various bridges that are shown in the various Potter films, but did happen to see them while on our Tour for Muggles. Two of the most popular bridges include the Millennium Bridge – famously “blown up” by Death Eaters in the 6th film – and Lambeth Bridge, on which the Knight Bus squeezes between two double decker buses in the 3rd film. These are definitely worth visiting while in the context of a tour since you can learn all sorts of interesting facts and tidbits about the filming! I’ve already mentioned Platform 9 and ¾ at King’s Cross station above. Next to that is St. Pancras train station. This is definitely worth getting a look at from the outside. You’ll likely recognize it from Harry Potter and the Chamber of Secrets since Harry and Ron fly over it in Arthur Weasley’s flying Ford Anglia. The other tube station of note is the Westminster station. This is where scenes from Harry Potter and the Order of the Phoenix filmed scenes of Harry and Arthur Weasley traveling to the Ministry of Magic. As with the bridges above, these are great stops to visit while on a tour! Ok, I’ll call this one the “bonus” 9th location, since it isn’t in London. We hopped on a bus to Oxford (about an hour and a half away) to explore the town and take part in a tour of Harry Potter film locations. The tour, booked through Viator, was a great way to see the university, see some of the iconic filming locations (like the tree where Draco was turned into a ferret), and learn a TON about Oxford and its history. Our tour guide was great! He took individual/small group photos of everyone at several of the more famous sites. We were also able to walk around at each place and explore before or after he spoke about the area. After the tour, we went to an old pub, The Eagle and Child, which used to be frequented by the Inklings (J.R.R. Tolkein and C.S. Lewis, among others). I had the most delicious vegetarian potato, spinach, and smoked cheddar pie. If you get a chance to go, it is definitely worth a visit! This is certainly not an exhaustive list of all of the Harry Potter-themed things to do while in the UK, or even just in London, but it’s a great start! There are a host of private and group tours, guided and self-guided walking tours, annual events, et cetera. The magic awaits you!